"Hidden Mickey Guy" Steven Barrett searches all four of the Disney Cruise Line ships for camouflaged images of Mickey Mouse to bring his field guide to maritime "Hidden Mickeys" up-to-date with his latest findings. Four scavenger hunts offer cryptic clues to Mickey's hiding places aboard the Disney Dream, the Disney Fantasy, the Disney Magic, and the Disney Wonder. A fifth scavenger hunt covers the landlubber Mickeys hiding on Castaway Cay, Disney's private island in the Bahamas. Compete or join with family and friends to spot Mickey. Or simply search for him wherever you find yourself on sea or on land by turning to the Index to Mickey's Hiding Places. Fun for all! 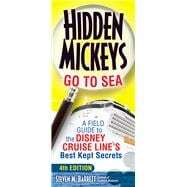 Includes complete descriptions of every Hidden Mickey in the field guide plus hints to help you find the elusive mouse. Steven M. Barrett is a leading authority on Hidden Mickeys, which are camouflaged images of Mickey Mouse that Disney's Imagineers and artists have hidden in virtually every Disney property around the world. The author of the best-selling guides Hidden Mickeys: A Field Guide to Walt Disney World's Best Kept Secrets, Disneyland's Hidden Mickeys, and Hidden Mickeys Go to Sea, Barrett lives in Seminole County, Florida, close to both Orlando and Walt Disney World. His website, www.HiddenMickeyGuy.com, is the go-to reference for Hidden Mickeys fans. Table of Contents . . . . . . . . . . .